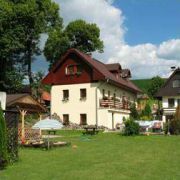 Four separate apartments in the apartments-house ADA with floor heating in the village of Liptovský Trnovec - great … More » for families, groups, or anyone seeking relax and retreat - year-round open THERMAL aquapark TATRALANDIA, the largest Slovak SKI resort of JASNÁ - Chopok North. 4 luxury apartments for max 26 persons, 500m from Bešeňová. 2 separate building without the presence of the owner … More » . Suitable for families with children. Pleasant sitting by the grill on the large garden in summer. Living room for 20 persons with fireplace, DVD, SAT, Playstation 3. Sportground.